We spend most of our time in buildings – working shopping, learning, sleeping. It’s not surprising, therefore, that these buildings consume a lot of energy. Most of it is used for heating, cooling and ventilation, through technologies known as technical building systems (TBS). If these are incorrectly designed and installed, poorly maintained or inefficiently managed, then the whole building, and its occupants, can suffer as a result. The good news is, it doesn’t need to be this way. The technologies that have proved to make our buildings and the systems within them more efficient are available, and yet they are still missing in most buildings. 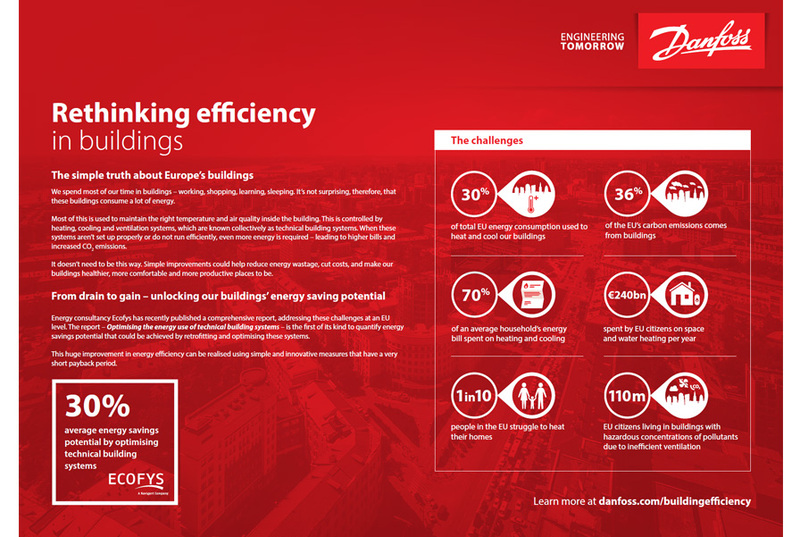 On behalf of Danfoss, energy consultancy, Ecofys, recently published its first report to quantify the huge, untapped potential for energy savings that could be achieved by retrofitting technical building systems. Before now, we lacked an estimate of the magnitude of this potential at EU level. The Ecofys report provides strong evidence that, with the right investments, we could save an average of 30% on energy consumption in the buildings that will be renovated within the EU up until 2030. The report also shows that, by 2030, we could save up to 67 billion Euros per year on energy costs if TBS would be gradually and consistently retrofitted with high-performance solutions across Europe. This is equivalent to around 15% of the EU 2030 energy-efficiency target savings. You can learn more about the enormous potential for energy savings by optimizing buildings by tuning into the Ecofys study webinar that you can find on this website. The need for energy conservation is a key driver in the development of speed control devices, and AC drives provide the optimum method of controlling the speed of electrical motors to match load demand. Even small changes in motor speed can cause significant changes in energy consumption. AC drives are installed on a daily basis in various heating, ventilation and air conditioning (HVAC) and water-boosting applications in new and existing buildings and infrastructural systems all over the world. They improve control and energy-saving possibilities, enhance air quality and indoor comfort levels, and increase reliability. You can read more about the VLT® HVAC Drive here. Optimizing our technical building systems needs to be a high priority, and the Ecofys report clearly shows the path we need to take. Even simple improvements could help reduce energy waste, cut costs, and make our buildings healthier, more comfortable and more productive places to be. The environmental and economic opportunities are vast. So, let’s stop talking and start acting.